In the spring of 87 BC Sulla landed at Illyria. Asia was occupied by the forces of Mithridates VI of Pontus, under the command of Archelaus. Sulla’s first target was Athens, ruled by the tyrant Aristion. Sulla moved southeast, picking up supplies and reinforcements as he went. 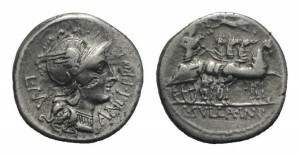 Sulla’s chief of staff was Lucullus, who went ahead of him to scout the way and negotiate with Bruttius Sura, the existing Roman commander in Greece. After speaking with Lucullus, Sura handed over the command of his troops to Sulla. At Chaeronea, ambassadors from all the major cities of Greece (except Athens) met with Sulla, who impressed on them Rome’s determination to drive Mithridates from Greece and Asia Province. The invasion of Mithridates VI of Pontus caused war between Rome and Pontus. Allegedly up to 80,000 Roman citizens were massacred. Before long, Mithridates VI had won over all the Greek city states who had previously been under Roman rule. After the arrival of Lucius Cornelius Sulla, the majority of the Greek city states returned to the Roman banners. Athens was not amongst the cities that returned to Roman dominance as their tyrant Aristion, imposed by Mithridates VI, would not capitulate to the invaders. 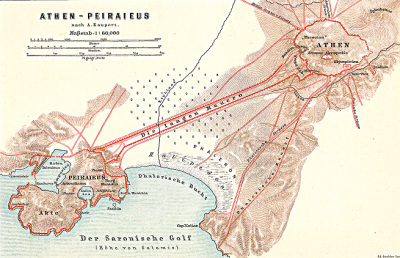 At the same time, Archelaus abandoned the city of Piraeus and concentrated his forces in the citadel of the city. In a bid to stop an escape by Archelaus who would surely join his reinforcement army sent by Mithridates VI elsewhere in Greece, Sulla left the taking of the Acropolis to Caius Scribonius Curio Burbulieus. In any case, Sulla, not having a navy, was powerless to stop the escape of Archelaus who was able to rejoin his relief army. Sulla then advanced into Boeotia to take on Archelaus’s armies and remove them from Greece. Before leaving the area however, he burnt the city of Piraeus to the ground.